Designed to economically recover valuable waste heat BTUs from boilers, kilns, dryers, ovens, thermal oxidizers and incinerators, QSense‚s highly efficient counter current flow exchanger typically provides a full savings payback within 1 to 3 years for most applications. 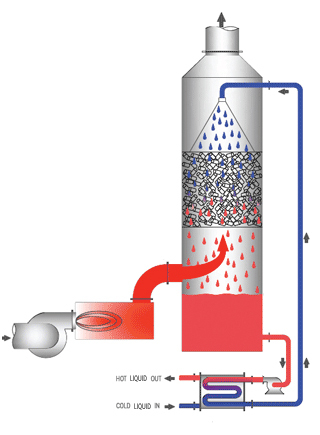 The recovered heat can then be used to preheat boiler feed water, meet or supplement building space heating requirements, or for heating process heat transfer fluids. The QSense™ Heat Exchanger is offered in a vertical configuration for maximum space savings, and with all necessary system components. For flue gases containing acid contaminants the unit can be equipped with neutralizing chemical reagents and for particulate laden streams, a pre-scrubber and clog-resistant contactor is available.